Baldwin's RM-10 wastewater treatment chemicals are designed to help clear difficult to treat wastewater. The RM-10 chemicals provide an alternative to conventional wastewater treatment systems that require multiple chemical additions throughout the treatment process. RM-10 chemicals consists of a combination of treatment chemicals which can be applied in a single application. 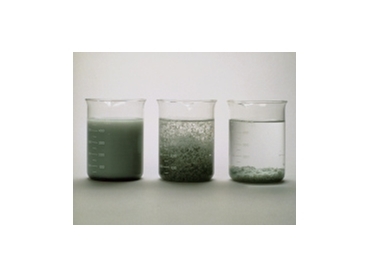 The RM-10 chemicals work by both lowering and raising the PH of water at various stages of the wastewater treatment process causing oils and other waste products to react in a mass that becomes encapsulated in clay particles. This process leaves the water clear with a non-leachable sludge on the side which can be easily removed. Baldwin's RM-10 wastewater treatment chemicals are available as three different units. The basic unit is the small moulded “Busta” units - manual units that treat 300-500 litres per day. The mid-range unit, the semi-automatic unit requires minimal operator time and is available in a painted mild steel construction for added strength. These units are ideal for treating 750-1000 litres per hour. The third unit is the fully automatic unit which is PLC controlled and of stainless steel construction for further strength. Treatment rates using this third product range from 1000 litres per hour to a maximum of 10,000 litres per hour and can continually treat without operator attention for 24 hours a day.